It’s once again the time of year to celebrate mothers! Why not get the entire family gathered and enjoy some fun, memorable experiences for and with mom? As you know, Mom’s truly enjoy time with family and nothing makes her happier than sharing special moments filled with laughter and love. Here are some fabulous ideas that mom is sure to appreciate! A Little Pampering Never Hurts! Mothers around the world take care of their families every day of the year. How about pampering mom this Mother’s Day with a gift of the rest and relaxation she deserves. Ask mom to make a list of some “services” she would enjoy as Mother’s Day treats. She will surely have some great ideas, but if her list falls short, consider these pampering “services” you can provide: an opportunity to sleep late, a manicure or pedicure at the salon of her choice, an hour of quiet to soak in the tub, read her favorite book, or listen to music, or the gift of no arguing/teasing/taunting between siblings. Make coupons for these “services” and let mom redeem them on Mother’s Day or in the week that follows. There are a number of ways you can accomplish this in a unique way. Rather than cut flowers, plant your mom’s favorite flowers in a special container or a visible spot in her garden. No garden, no problem, create a new flower for mom. Then make signs/pictures/messages and mount them on garden stakes in the newly planted flower garden (“We love you!” “Happy Mother’s Day”). If you’re feeling super creative, consider planting mom’s flower garden in the shape of a message, like maybe a heart, the word MOM, or some other special message. What does mom enjoy more than anything? Your affection of course! And what better way to show mom how much you love her than with hugs and kisses? 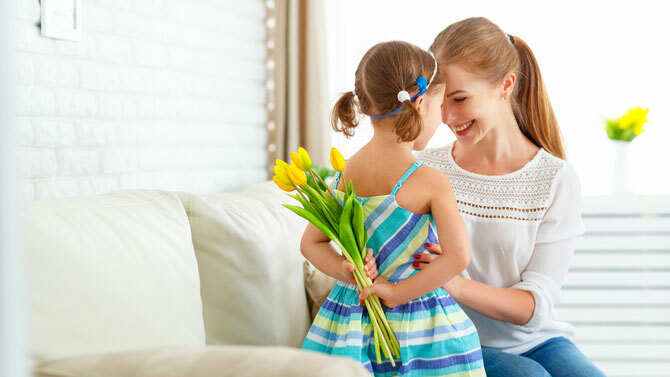 Create a fun schedule with times to surprise mom with hugs or kisses throughout the day. It should be a schedule of silly actions, antics, and laughter, which along with your hugs and kisses will make mom’s day! While you probably can’t plan or finance mom’s dream vacation in a few days, you can plan a fun day wherever you live to emulate that special place that mom dreams of visiting one day. Does mom want a tropical escape to an exotic island? Decorate with a tropical theme, present mom with a lei or island flower, and serve her exotic fruits for breakfast, closing out her Mother’s Day with dinner at a local island themed restaurant. Whatever mom’s dream destination, you can find decorations, foods, and other special items to make her ‘dreams’ come true even if only a small way. While everyone’s vision of a masterpiece may be different, your mom will love whatever you create in her honor. Whether your masterpiece is a finger paint extravaganza of the entire family’s handprints/footprints or a colorful clay flowerpot creation, or a drawing, sketch, painting, poem, or song, your mom will surely appreciate your unique masterpiece and gift to her. Nearly every mom will enjoy spending time with the whole family on Mother’s Day no matter what you chose to do! Gather everyone in the family room and pull out the old photos, slides, or home movies for an afternoon of reminiscing, memory making, and laughter. Grab mom’s vinyl or CD collection and listen to some of her favorite songs, if everyone is willing, maybe dress up and put on a lip-sync concert for mom – what fun! If you think mom would like something a little more subdued, take a blanket outside with your favorite book for reading time with mom and all the family.